Participating in an internship is one of the best ways to prepare for a career in the culinary arts. International student will not only have the opportunity to gain valuable work experience, but they can decide which path of culinary arts they want to pursue. No matter which direction an international student chooses to go, gaining work experience will prove important when looking for employment after graduation. To find out more, read on to see why culinary arts internships are so valuable! Aristotle once said, "What we have to learn to do, we learn by doing." This is where a culinary arts internship comes in for those international students who want to pursue a career in the culinary arts; the best way to learn how to do something is by doing it! This is especially true for the culinary arts because it is the type of career that involves experience and technique which can only be acquired through practice. So where can an international student acquire this experience? Not only does the United States have a number of good culinary programs, but it has many options for internships as well! There are different ways an international student can get a culinary arts internship; perhaps one of the easiest ways is though an internship placement company. These companies help individuals find internships and schools within the U.S. There are many different internship placement companies, so just do little research and see which one you prefer. These internship placement companies typically match students with the company and position best suited to their needs. Using an internship placement company can be especially beneficial to international students for many reasons. First of all, many placement companies have an extensive network of contacts and organizations that they partner with. In some cases, resume may get special consideration in some of the more competitive internships. Not only that, but these internship placement companies make it easy. If students don't have time to spend submitting your resume to a variety of restaurants, resorts, etc., these companies will typically do the work for you. Be prepared as some companies may ask for a placement fee however. Most schools have a career center for their students. The purpose of the career center is to help students find internships, make networking connections, and find a job following graduation. Usually the career center will have a list of organizations that offer internships for students; you can go to the office regularly or check their website often for updates and new internships. Also you can ask to be a part of their email list if they have one and they'll send you any new opportunities that come up! Finding an internship on your own is not as hard as you think! There are tons of resources you can use to find an internship; websites like internships.com has over almost 21,000 internships listed from over 10,000 companies. You can also use social networking as well! Use your connections on sites like LinkedIn and Facebook to spread the word that you are looking for an internship, your friends may be able to help you find something. You could also ask any of your professors or teachers if they need extra help with a current project or job, or if they know anyone looking for an intern. Your other option is to find a hotel, restaurant, or other business you are interested in and ask them yourself! Their website should have internship opportunities listed under the career section of their website or you can call or visit the human resources office to ask in person. If you will be applying for a culinary arts internship, the process will depend if you are in your home country when you are looking – or whether you are currently studying in the US. Since you normally apply for an internship after your first few years of schooling most international students will be applying for an internship within the US. To participate in an internship, work study, or job in the USA international students will need to obtain the proper authorization to do so. If you have an F-1 visa then you may be eligible for either Curricular Practical Training (CPT) or Optional Practical Training (OPT). CPT involves the authorization for work experience that is required or is an important part of your study program. And for the culinary arts an internship is usually considered a necessary experience. Any student with an F-1 visa is eligible for a 12 month OPT. This means you can participate in a job or internship that is directly related to what you are studying. You can get authorization to work, but it can take several months to obtain. For more information and details on obtaining both of these practical training options visit Working in the USA. If you are looking to gain experience in the culinary industry, you may consider doing a work travel program. If selected as a potential candidate for an internship position, there will most likely be an interview. Many of these internships will involve either a phone or Skype interview with the host company before you are accepted. After you´ve been hired you need to get the proper documents to live in the United States. Most internships in the USA require a DS-2019 form (certificate of eligibility for exchange visitor status) which can be acquired through the company or work travel program. Once you obtain the DS-2019 form you are eligible for a J-1 visa which will allow you to live in the USA during your internship. If you use a placement company to obtain your internship they will help you get all the appropriate documentation, if you have arranged for the internship by yourself, your company should be familiar with the process of obtaining this documentation for their interns. Receiving the DS-2019 form can take between 4 to 6 weeks, and the time it takes to obtain a J-1 visa depends on what country you live in, so give yourself plenty of time before the start of your internship to get the appropriate documents. Keep in mind that many internships may also require a certain level of English so make sure to take any English evaluation test beforehand if necessary. Culinary arts summer internships are becoming more and more popular within the U.S. When international students finish school for the summer, they may decide to continue their education outside the classroom. Summertime is especially important within the culinary arts and hospitality industries because it is their busiest time of year. Many businesses need extra help during summer which gives students a better chance of obtaining an internship. Culinary arts summer internships are a good option for international students because they are able to gain real world experience, learn more another culture, get hands on experience in culinary arts, possibly earn money, and improve job prospects without disrupting your studies. It´s a great and productive way to enjoy your summer! You will also need to prove that your English skills are good enough to attend classes where everyone speaks English. 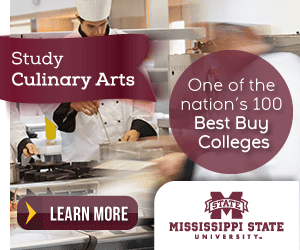 Most culinary arts schools accept the TOEFL	test, but whether they accept the internet or paper based test and what score you must have to attend may vary among schools. If you've grown up speaking English, or your schooling included many years of formal English classes, you may have the testing requirement waived, again depending on the school you want to study with. Clearly participating in an internship is a great way for international students to learn about the culinary arts. Students can choose to use an internship placement program, use their college or university resources, or obtain an internship on their own. Whether interning during the school year, or participating in a culinary arts summer internships, there are many internship opportunities across the US so the hardest part might just be choosing the one that's best for them!